Having given the SASB technology to the University of Utah in 1995 in order to avoid conflict of interest as a University professor, I shall continue to support SASB until and if it is acquired by a professional testing company. This means I will continue to update the software, manuals, discs, and provide minimal support to users. Occasionally I have made changes to the programs to meet a user’s special needs. 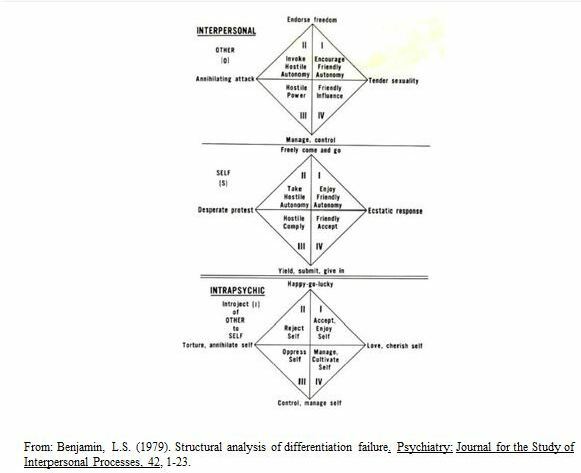 Quadrant version of SASB first published in Benjamin, 1979, copyright William Alanson White Psychiatric institute. For help with learning SASB concepts and data processing and interpretation, I usually refer people to Dr. Ken Critchfield for fee for service assistance. Information about who is qualified to use SASB software and questionnaires and how to purchase the materials is available by emailing Intrex@psych.utah.edu.